Crested Butte, CO (November 9, 2015)- The Crested Butte/Mt. 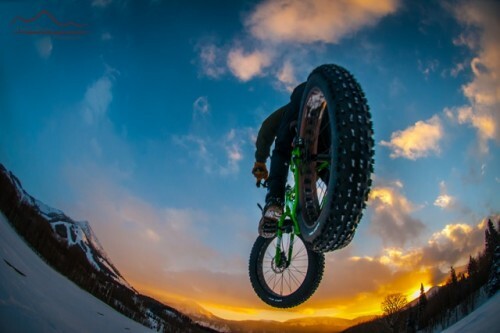 Crested Butte Chamber of Commerce is pleased to host the first ever Borealis Fat Bike World Championships presented by Odell Brewing Company, January 27-31, 2016. The four-day festival will feature three days of racing, parties, music, food, raffles, and more. Additionally, it will feature a conference on fat biking and land management issues. Races will include a backcountry course, a town course in Crested Butte, and a race at the Crested Butte Mountain Resort. In an effort to bring back the soul and the flavor of the original grassroots bike festivals, we are planning on a 1990s Mountain Bike Revival by inviting the stalwarts of the industry to get back in the saddle and duke it out amongst the old rivalries. Dave Wiens, six time Leadville 100 champion, MTB legend and Hall of Famer, has thrown his hat in the ring and is looking forward to saddling up and throwing down. Borealis Fat Bike Company is based out of Colorado Springs and builds cutting-edge race and recreation Fat Bikes. They will roll into town with a fleet of demos for event participants and spectators alike. In addition, the Regional Fat Bike Summit will provide opportunities to get Land Managers, Nordic Centers, Ski Resort representatives, enthusiasts and more on Fat Bikes. Odell Brewing Company – Doug, Wynne, and Corkie – started their brewing odyssey in 1989 in a converted grain elevator located on the outskirts of downtown Fort Collins, CO. Odell was just the second microbrewery to open in Colorado. We are proud to bring their craft beer to this craft event and provide libations that are matched to the character and grit of the Fat Biker. Borealis Fat Bike World Championships presented by Odell Brewing Company is an event that is for all shapes, sizes, and levels of ability. The races/rides will be timed but racers can do their thing while others simply ride just for the fun of it. The winners of Fat Bike Worlds itself however, will be branded with the Fat Bike Worlds logo. Location of the branding will be at the Ladies and Mens winners’ discretion. Sponsors for the first ever annual Borealis Fat Bike World Championships include Borealis, Odell Brewing, Co., the Town of Mt. Crested Butte, Quality Bicycle Products, Salsa Cycles, Surly Bikes, 45NRTH, Gunnison-Crested Butte Tourism Association, Crested Butte Mountain Resort, the Town of Crested Butte, Bikepackers Magazine, FAT-BIKE.com, Chopwood Mercantile, and more.